The Trump family gathered outside the White House on Monday to share in the experience of the Great American Eclipse. 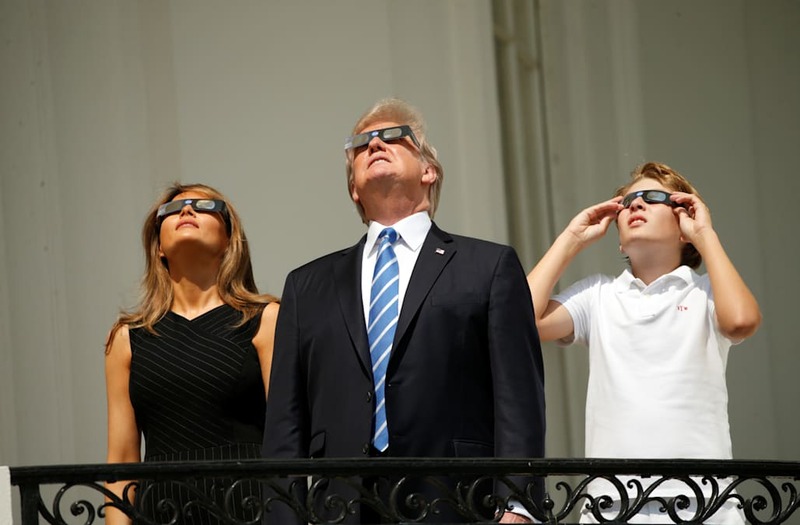 President Trump, first lady Melania Trump and 11-year-old Barron Trump grabbed their protective eyewear and viewed the first total solar eclipse to pass over most of the United States in almost 100 years. As is seen in this video, President Trump was looking up to the sky in front of a crowd gathered at the White House when someone yelled "Don't look!" As many on Twitter pointed out, two different photos show Trump staring up at the eclipse with just the protection of his naked eye. Trump looking directly into the eclipse pretty much sums up 2017. Don't tweet Don't say that Don't look directly into the sun during a solar eclipse Donald Trump really does do what people tell him not to.